David the Letterman – Who IS that Man? David has spent his entire career in photography including Photojournalism and industrial commercial photography. Over the past few years he has enjoyed compiling a library of to date over two thousand alphabet photographs of everyday objects taken from different angles to capture letters and reproduces them in sepia 4 x 6 prints. David reflected: “The idea is not an original one, it is something I did thirty odd years ago for fun with family and friends. It was when volunteering at the local school and the literacy programme that I invented a little game to find letters among the desks and chairs of the classroom. That was the aha moment, recalling the past and approaching the subject from a different angle”. ‘Original’, ‘unique’ and ‘personal’ are three words that seldom go together. Photographer David Matthews has captured that and more with his imagination and talents as a photographer and has just launched his new line which he calls “Lettergraphs”. 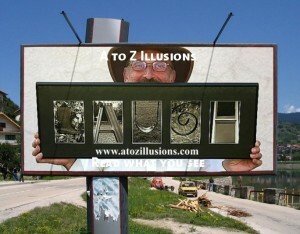 These can be seen on his web site www.atozillusions.comwhere you can easy create your own special name or word. Since the launch or his web site the response has been wonderful. David said, “I am now sending L-O-V-E and H-A-P-P-I-N-E-S-S to customers from every corner of the world”. Some letters are infinitely tougher to find than others. While “Q” is surprisingly easy to find, anyone with a lead on capital “R” and “Z” is welcome to contact him. 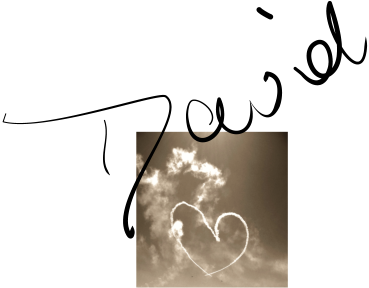 The word LOVE has proved very popular. Runner ups are first and last names as well as inspirational words like ‘Laugh’, ‘Smile’ and ‘Hope’. “Friends, family and customers are now looking out for letters and phone me to say, ‘Hey David there is a great ‘A’ at such and such a place'”. The library is forever expanding, and you can create your own on the A to Z Illusions web store and keep up with the latest letters and places they will be setting up their exhibition booth on the Facebook fan page. Further details can be obtained emailing from the site contact page or connecting via Facebook. how big is the picture if i got the word Chay in a frame? like 5 x 6? ?